Image caption David Jones said it would require an "awful lot of political courage" from Prime Minister Theresa May to delay Brexit. The public would feel "cheated" if Brexit did not happen on time, a former Welsh Secretary has warned. 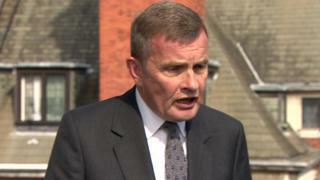 Clwyd West Tory MP David Jones said it would require an "awful lot of political courage" from Prime Minister Theresa May to delay the process. Mr Jones, a Brexiteer, has twice voted against Theresa May's deal. Last week MPs voted to reject a no-deal Brexit, in a non-binding Commons vote. The UK is currently due to leave the EU on 29 March. Mr Jones told Radio 4's Today programme that the decision to rule out leaving without a deal had a "political effect" rather than a legal one. The former Brexit minister said: "In order for us not to leave on Friday of next week the law would have to be changed. "Now that could be changed by a statutory instrument (a piece of secondary legislation). "But that would require an awful lot of political courage on the part of the prime minister because I think there would be extreme concern right across the Conservative Party and indeed right across the country as a whole if they felt that they were being cheated of Brexit, which is what that would amount to." On Monday the House of Commons Speaker ruled the prime minister could not bring her deal back for a third vote without "substantial changes". Brexit Secretary Stephen Barclay suggested the government could still try to hold a vote next week. Mr Jones said John Bercow's decision was "absolutely accurate". He added that Mrs May should go to the EU council meeting later this week seeking to have "considerably more" on the Irish backstop, which is the "deal-breaker". Chris Davies, Conservative MP for Brecon and Radnor, said: "He is able to dig up ancient laws when it suits him for his own interests. "Pretty appalling state of affairs when a single person is trying to run the country - it used to be called a dictatorship!"